There is always a sense of excitement when I set off to visit somewhere new; a sort of butterflies-in-the-tummy type of feeling with the anticipation of what adventures await when I arrive. Never was this truer when we set off on the long flight from London Heathrow to Tokyo Narita, and my first trip to a whole new continent. We spent most of the time exploring the capital city, with its ancient temples and shrines standing in stark contrast with the ultra-modern skyscrapers and often futuristic restaurants and shops. The Shibuya Scramble crossing is the busiest pedestrian crossroads in the world, with up to 2,500 people crossing at any one time. We found the traditional cache, Loneliness without you (GC252PG), which refers to the statue of the famous dog Hachikō, who waited every day outside Shibuya station for his owner to return from work. This was undoubtedly the most muggle intense area I’ve found a cache in, but the sheer number of people meant that nobody really paid attention to us. 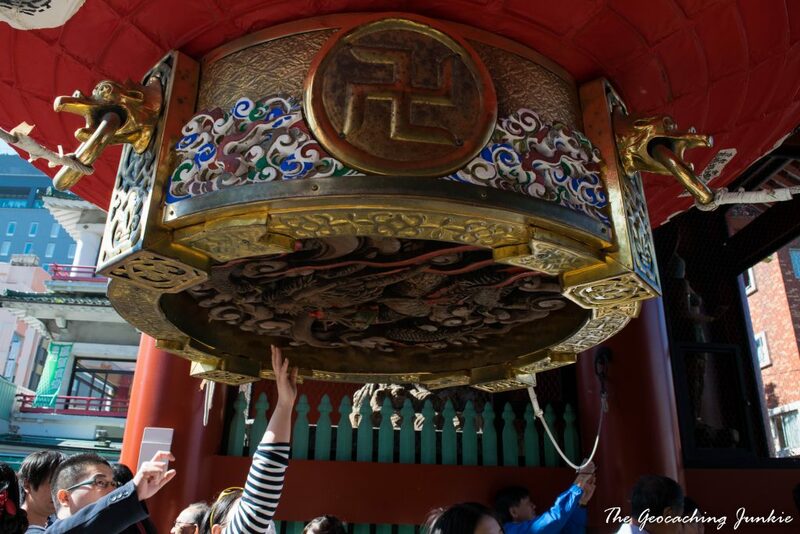 The Sensō-ji Buddhist temple is one of the most visited attractions in Tokyo and is also home to the most favourited geocache in Japan: Asakusa Kaminarimon (GC38J50). The cache is located just outside the main entrance gate to the temple area and again, in a location with many muggles milling around. It’s a small size cache containing the most darling personalised swag bearing the cache name and I was able to drop some travel bugs off too. 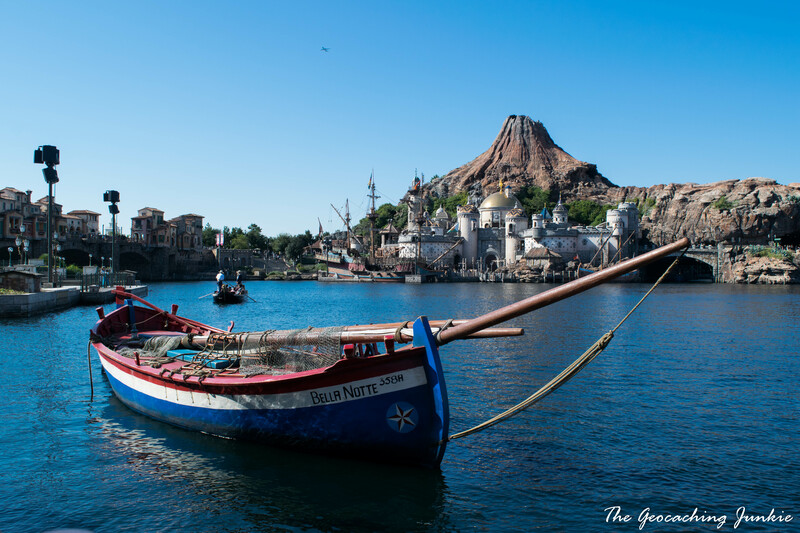 When we visited the unique Tokyo Disney Sea theme park, we had the opportunity to examine the EarthCache Mt. Prometheus / プロメテウス火山 (GC31H0H), based on the very realistic volcano inside the park. This was the first time I had found an EC based on a model of a geological feature, but the volcano and all its features are so lifelike that the local reviewers and Groundspeak decided to allow it. It might be the closest we will ever get to an ‘erupting’ volcano, as it started to spew ‘lava’ during the evening’s light show! Japan’s ancient capital, Kyoto, has a much more subdued pace of life in comparison to Tokyo. 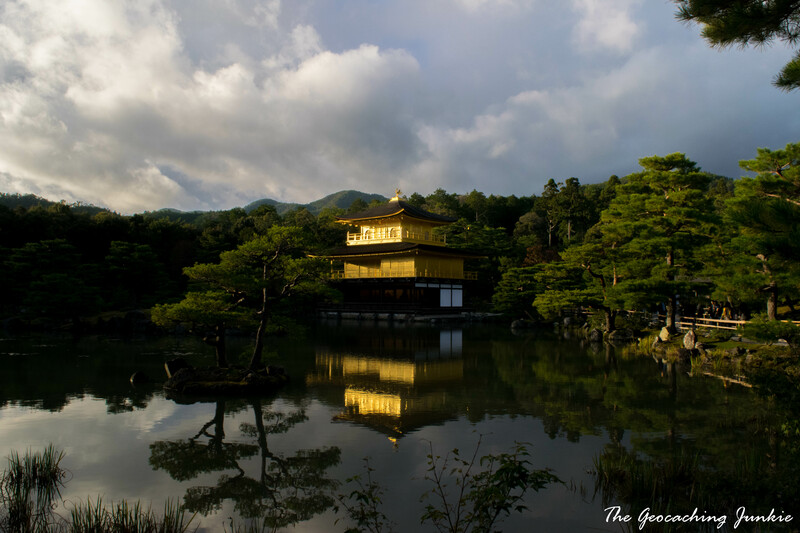 After taking the Shinkansen bullet train from Tokyo, we headed straight to the Kinkaku-ji temple, also known as the Golden Pavilion. The entire façade is covered in gold leaf and is quite a sight to behold. We had the chance to find the traditional cache, Kinkakuji-temple #Kinukake road (GC3B9NY), as we exited the temple – it’s always nice to mark a visit somewhere with a smiley on the map! One of the highlights of our trip was a visit to the amazing Fushimi Inari-Taisha shrine just outside Kyoto. Famous for its 10,000 torii gates, the tunnels of vermillion are unlike anything I’ve ever seen before. We happened to meet two French geocachers at the cache Red Torii (GC56M9R), a very clever hide, well-crafted to fit in with its surroundings. Having been highly recommended to visit Nara National Park before our trip, we made sure to take the short train journey from Kyoto. Nara is famous for its wild Sika deer that roam freely, mostly within the National Park, but sometimes spill out on to the streets. 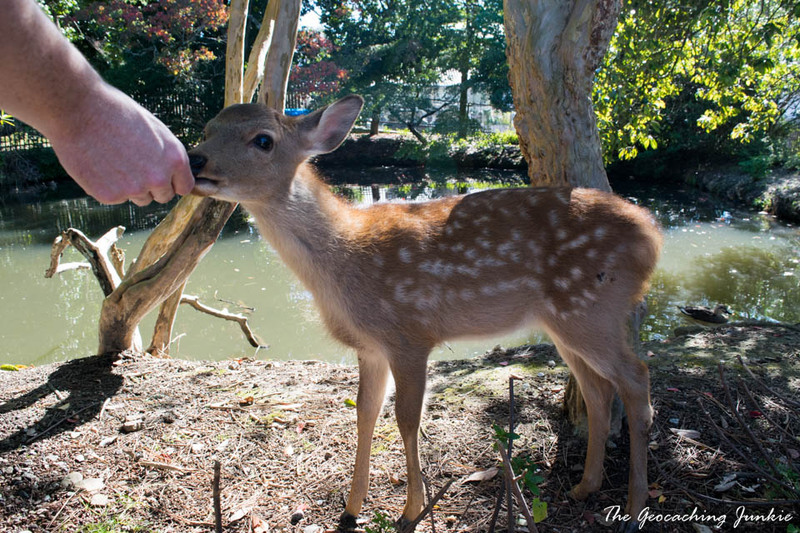 The deer bow to request food and deer crackers or ‘shika senbei’ to feed them. This was one of the most magical experiences I have ever had and one of the reasons I fell in love with Japan. There are several geocaches to find in the park, including Nara National Museum (GC37DEX) and Deer Park Rest Area (GC49CW9). 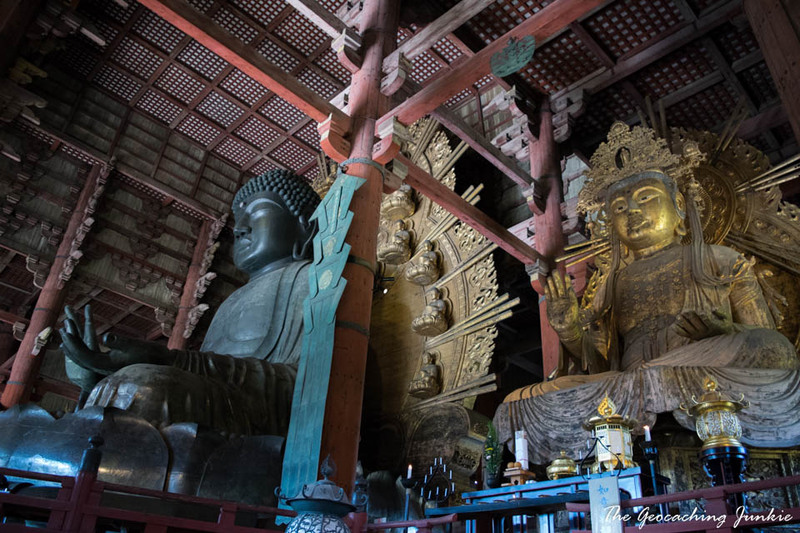 Also in Nara National Park is the Tōdai-ji temple, which is home to the world’s largest bronze Buddha. It really has to be seen to be believed: it’s immense! We found a nice little cache at the Nandaimon Gate, Todaiji 東大寺南大門 (GC6CGRV), while we watched a deer take someone’s lunch out of their hand! 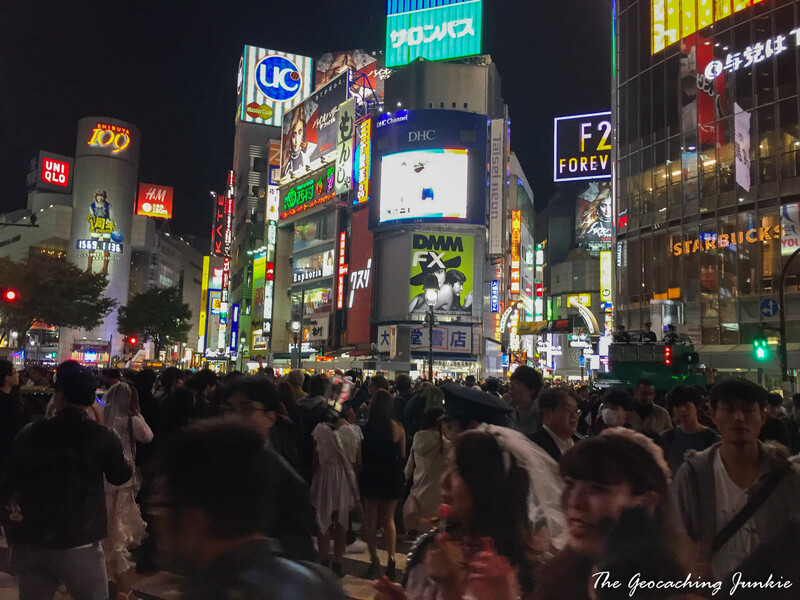 We only experienced a tiny fraction of what Japan has to offer and we’re looking forward to travelling more extensively there in the not too distant future.